Hermit crabs are entertaining creatures that will interact with their human companions with a little patience. Just like any other pet, you have to handle a hermit crab appropriately, both to avoid injury to the crab as well as prevent injury to yourself. Hermit crabs are very delicate and fragile, so children should only handle them under the supervision of a responsible adult. The more you interact with your hermit crab, the more comfortable and active he will become with you. Always handle a hermit crab over a low or padded surface. A hermit crab that is dropped from a substantial height or lands on a hard surface can be gravely injured. Consider spreading a beach towel on the carpet to give you a “playground” where you can safely interact with your crab. Don’t let your crab get out of your sight, as he can move quickly and may become lost. Pick up your hermit crab from the back portion of his shell. Never pick your crab up from his claws, legs or head. Don’t be surprised if it takes awhile for him to be comfortable enough to walk around in your presence. A crab will naturally retreat into his shell and use his largest pincher claw to block the entrance, which is a defense against predators. Beware of pinches -- crabs will pinch if they are frightened or feel like they are going to fall, so always hold your hand flat when handling them. If your crab pinches you, put your hand back in his habitat and mist him with water, which should encourage him to let go. Hermit crabs can carry salmonella, which means you must carefully wash your hands with antibacterial soap after handling them. Also wash your hands after cleaning the crab habitat or disposing of soiled substrate and uneaten food. Additionally, if you allow your crab to walk on any household surfaces, clean the surface with a disinfecting spray afterward to ward off risk of disease. 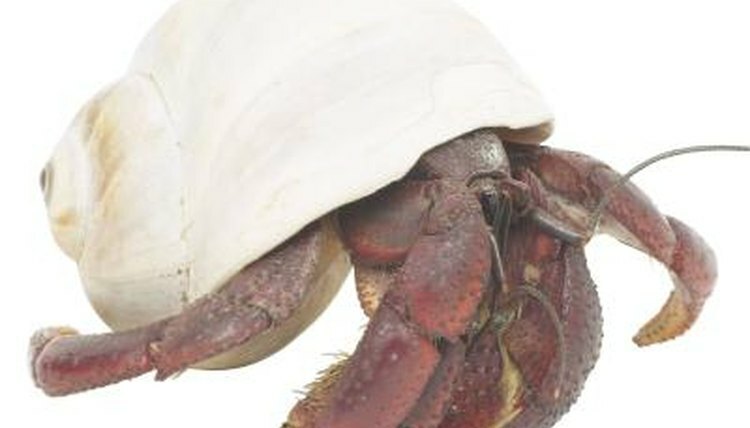 Hermit crabs grow by shedding, or molting their outer exoskeleton, usually twice a year. A crab will partially or fully extract his body from his shell for the molting process, and during this time, your crab is especially vulnerable, particularly to cage mates. Sequester your crab in a private tank or section him off from his companions with a cage divider. Keep him misted and moist to help with the molt, and do not handle your crab or pick him up. He will be soft and pink for several days after the molt, and you should not put him back into the general tank or handle him until his new shell is firm.